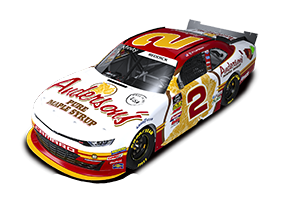 Anderson's Maple Syrup was once again the primary sponsor of JDM's Chevy Silverado for the 6th time this season in the Coca-Cola 250 powed by fred's at the Talladega Superspeedway on Saturday, October 6th, with the race being broadcast live on SPEED. Ron followed up a strong showing in practice with a good qualifying run to start the race in the 10th position. When the green flag dropped on the 94-lap race, Hornaday put his Anderson's Pure Maple Syrup Chevrolet to work and advanced three positions on the start, up to seventh. Hornaday would end up running strong up near the front through the early portion of the race, until he was involved in a wreck on lap 61. While still able to consistently run in the top 10, a couple of flat tires, ultimately resulting from the earlier damage, relegated Ron to a 28th place finish.